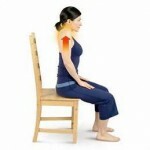 The neck is a common place to hold muscle tension and stress. Combine your shoulder shrug stretch with deep breathing for an instant tension and stress release. Here’s how: Inhale, pull your shoulders up toward your ears. Exhale and pull your shoulders down and back.